Add a touch of luxury by sprinkling over a little diced smoked salmon over the soup. Add a generous grinding of black pepper and a good squeeze of lemon juice to bring the flavours together. Add the oil, onions and potato to medium non-stick pan and stir to coat the vegetables with the oil. Cook on a medium heat and then cover the pan and leave to sweat for 8 minutes. Add the stock, bring to the boil, season with pepper and nutmeg, and reduce the heat to simmer for 4 minutes. Add the lettuce and simmer for 7 more minutes. Add the dill and allow to cook for a further minute. 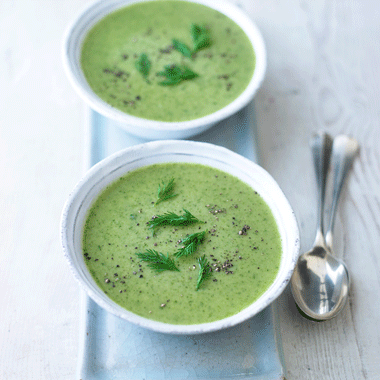 Blend the soup until smooth, using a hand-held blender or by transferring to a food processor. Strain it through a sieve back into the pan. Add the crème fraiche and stir through gently, then season with pepper. Ladle the soup into warmed bowls and sprinkle the dill on top. Serve with rye bread spread with a little cream cheese if you like.